Katja Riedel grew up in Germany where she studied and completed a PhD in Atmospheric Chemistry. For her research she overwintered 1997 at the German Antarctic Base Neumayer where she was responsible for the Atmospheric Observatory. Since then she has been on several scientific expeditions to Antarctica, for example measuring ozone at Scott Base and drilling ice cores at Law Dome. Eleven years ago the great outdoors drew her to New Zealand which she calls now home, and to NIWA in Wellington. 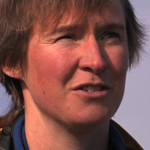 Her main research interests are greenhouse gases in the atmosphere and in ice cores. She is also passionate about science communication. She teaches university courses, gives lectures for school classes and community groups and has worked as a guide and lecturer on passenger ships in the Arctic and Antarctic.